Dun Laoghaire Shopping Centre was built in 1977 making it one of the first shopping centres to be constructed in Ireland. 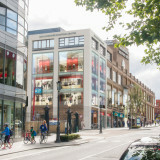 The centre has 5 retail levels with a rooftop car park and 4 storey office building overhead. The centre has 3 levels of mall accessible retail accommodation. 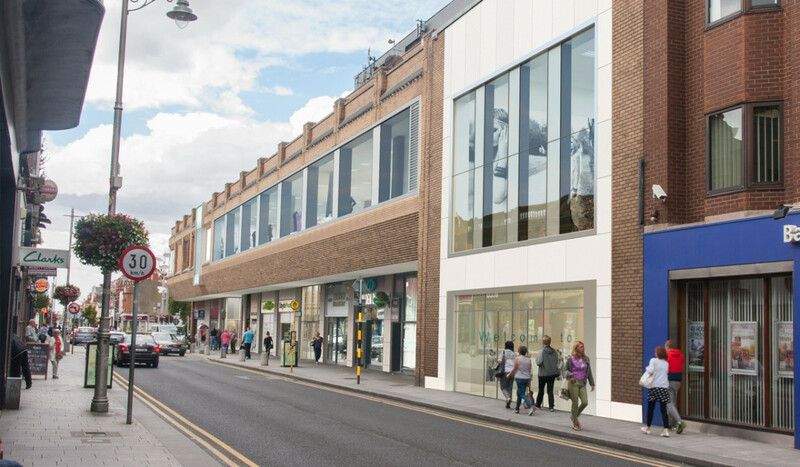 The proposed upgrade works consist of the reconfiguration of internal mall and retail space to provide new large format units at locations which will drive footfall through the centre and also works to the elevations to announce the arrival of the reconfigured retail offer, creating visibility between internal uses and the surrounding streets and marking the entrances.. The elevational upgrades include a new projecting double height glazed entrance lobby on Marine Road, marked with a projecting metal canopy at high level to provide maximum visibility on approach up Marine Road from the harbour. Either side there are a series of projecting glazed display boxes which will have a lantern like appearance from Marine Road at night time. The Marine Road corner is the signal for the centre when viewed on approach up Marine road from the harbour. 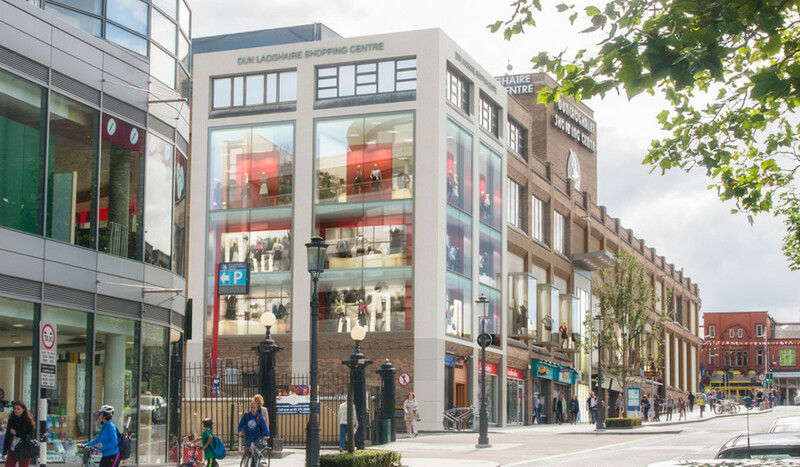 At this location it is proposed to introduce new triple height display windows incorporating display boxes and provide visibility into the centre. 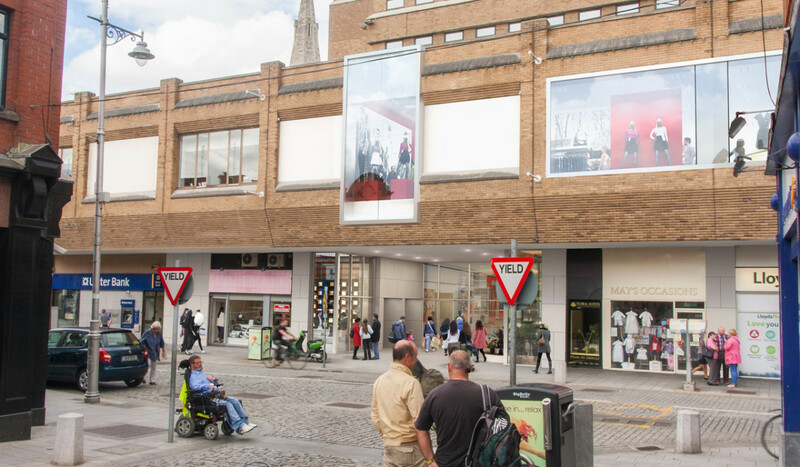 It is proposed to increase the height of the existing main Georges Street entrance to improve the draw into the centre. 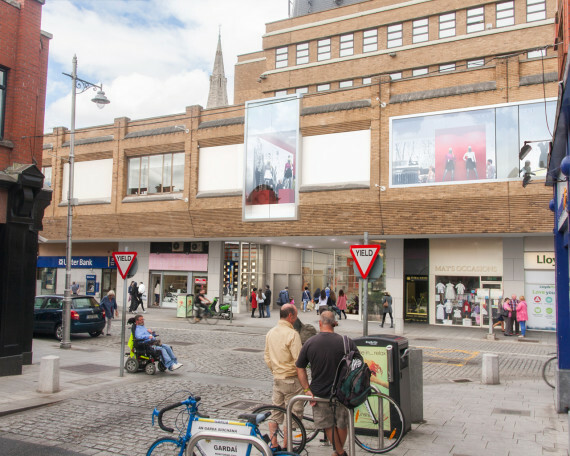 The proposal will also deliver a new anchor unit over two levels on George’s Street with the previous mall entrance becoming an on street entrance to the unit with a double height space just inside the doors providing a generous feeling of height and space on arrival. The existing windows are proposed to be reconfigured with a new stone cladding surround. Above Georges Street a long horizontal feature window is proposed to denote the position of the new proposed Anchor unit and to promote maximum visibility of the retail offer from the street below. 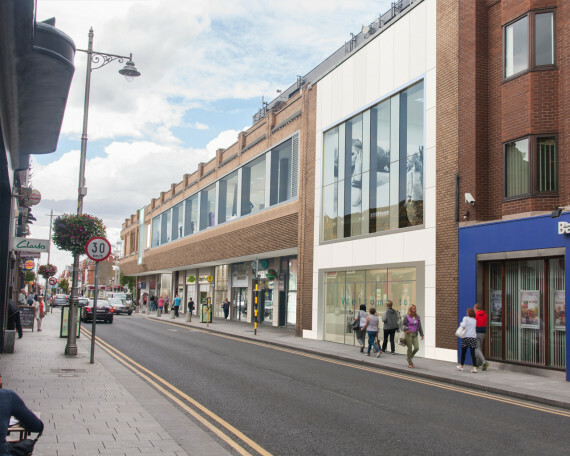 To improve the quality of the pedestrian experience on George’s Street the brick pilasters between the shop fronts will be re-clad with an off white coloured granite cladding and the soffit overhead will be finished with a new coat of white render.